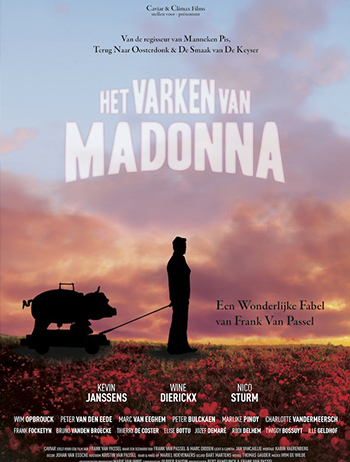 Synopsis: The tiny village of Madonna is found in the deepest of the Westdiep. It’s a depopulated village, the size of a pinhead but divided by local quarrels. The daily routine is seriously disturbed by a conflict between a striking fireman, a concupiscent mayor, a nervous priest and a scheming schoolteacher… Tony Roozen and Porki (a robotized piglet) show up in the strange polder village because of a car breakdown. Temporarily accommodated by the schoolteacher, Maria Glorie, and her old great grandmother, Tony must immediately turn back and leave this place in order to save his couple. But the inhabitants of the village have no intention to help him find his way back to the “civilized world”. They have other things in mind such as the coming referendum about the moving of the Madonna statue. And also there’s Prosper, who died at the front, still wandering and cheerfully singing in the village since the First World War. Can Madonna’s pig help them all?